THIS. WAS. AMAZING. Words cannot even begin to express how much I love these Bacon Ranch Turkey Wraps. I absolutely love the salt bacon, roasted turkey, smooth American cheese, creamy ranch dressing and crunch lettuce, tomatoes and onions. And all that goodness is rolled up in a low calorie, high fiber wrap?!?! YES!!!!! I took the idea for these wraps from the classic BLT. All I did was alter the traditional BLT sandwich to make it a bit more Weight Watchers friendly. It always seems like you need so much bacon in your BLT to really make a meal out of the sandwich, so I added turkey and cheese to give me a little more protein and make it more satisfying. The creamy ranch replaces the mayonnaise and adds a cool and delicious flavor. Pile on the lettuce, tomatoes and onions and you’ve got a wrap of deliciousness coming your way in absolutely no time. Flat-out Flatbreads are a great way to make wraps for me. They’re the perfect way to make a wrap. They’re the perfect texture and taste but they’re low in calories and points. If you’re not counting Points (or someone else in your family isn’t) feel free to use whatever tortilla wrap you’d like. American cheese adds a smooth flavor, but to keep the fat, calories and Points down, I used fat free American cheese. Just like with the wraps, if you’re not counting Points, feel free to use the full fat American cheese. It’s got a slightly better flavor and texture, but trust me, you won’t notice when you’ve got it wrapped up with the delicious bacon, turkey, ranch and fresh veggies. Another way to shave off another Point or two is to use turkey bacon instead of pork bacon. It’s an easy way to make it a little lighter, but in my opinion, the regular pork bacon is work the extra Points. 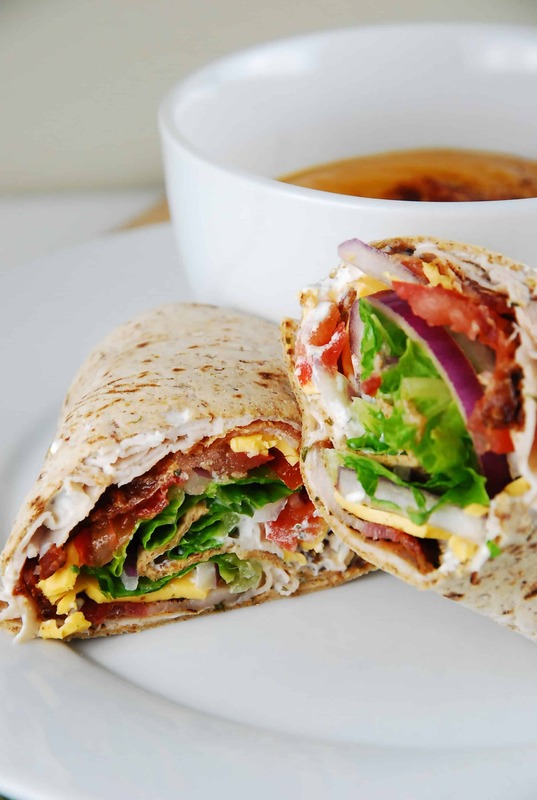 The bacon is really what makes this wrap (and makes it taste so delicious and not like you’re on a diet), so I recommend using the regular bacon. The flavor and texture is much better than turkey bacon. You might be concerned about all the other ingredients in the deli meat. If you’re worried about it, can’t eat deli meat or prefer not to, just use very thinly sliced turkey breast that you’ve roasted. You’ll get a very similar flavor but without the added preservatives from the deli meat. One of the best parts about these wraps is how incredibly easy they were to put together. All I had to do was cook the bacon, wash and prep the veggies and everything was ready to go. It was quick and easy for a lunch, or even a dinner on a hot summer night. The absolute best and perfect time to have BLT’s is when the tomatoes and lettuce are fresh from the garden, but for me, this wrap is good enough to have all year round. The classic BLT is good, but this Bacon Ranch Turkey Wrap recipe takes it to a whole new level. Trust me, if you love BLT’s, then these Bacon Ranch Turkey Wrap is going to blow your mind!! Heaven on a plate, these low calorie wraps are a Weight Watchers dream. Easy to make, and mouthwateringly delicious, this is one wrap recipe that you’ll want to make again and again. Spread ranch dressing all over the center of the flatbread. Top with turkey, bacon, lettuce, cheese, onion, and tomatoes. Fold the sides in, and then roll up. I was wondering if this recipe could be made the night before? I’m afraid it might be soggy the next day, but I don’t have time to put it together in the morning. Any thoughts? It sounds delicious! I would try Bolthouse Greek yogurt Ranch Dressing. You find it in the refrigerated section by the bagged lettuce. It is low fat and low calorie, I believe it is 1 point for 2 TBLS and it tastes AMAZING, like the real thing! Greek Yogurt cream cheese is also the bomb! How long do you cook it? I loved this wrap! Next time I think I will use 7 slices pepperoni (1 point) instead of bacon and 1 WW mozzarella sticks for a change in flavor! May work out to be lower points? Thank you for posting original recipe! I love your site and your recipes! I’ve tried a few and can’t wait to try more. I just don’t see how this recipe is only 6 points plus. When I count it, I keep getting 7 Points+. Even when I put all the ingredients including the veggies into the WW recipe builder and divide by 4 servings, I keep getting 7 Points + for each wrap. I added up all the nutritional info for all the ingredients, then divided by the number of servings. Then I entered that data into my WW calculator. I never use the WW Recipe Builder because often the data is inaccurate, as some basic ingredients can vary in the nutritional info, depending on the brand. So to get the most accurate Points, it’s always best to add up the info for each ingredient and then divide by the number of servings. Do not add up the Points of the ingredients….add up the nutritional info. Hope that helps! This was so delicious. Thanks for this great recipe. What type of bacon was used? There does not appear to be a link. Thanks! What kind of bacon did you use? The link doesn’t work. I always use turkey bacon and instead of the flat bread I used the low carb wraps.